We regularly have cause to write about the process of obtaining extensions of time under the Australian IP laws and regulations (often enough for this to be one of the special topics under the ‘Law and Practice’ category in our ‘Topics’ menu, above). this must have been causative of the failure to meet the deadline in question, which generally means that it must have occurred, or first arisen, prior to the deadline. This decision in relation to an extension request by Novo Nordisk Health Care AG, by Hearing Officer Dr Steven Barker, is an example of an approach that failed to show that these basic requirements were satisfied. With the benefit of hindsight, it is not hard to see what went wrong and what might, in retrospect, have been done differently. Novo Nordisk’s patent application no. 2005243427 was accepted, but lapsed due to non-payment of the official acceptance fees. The relevant deadline is three months after the application is advertised as accepted, which is also the deadline for opposing the grant of the patent. Right on the deadline (as is often the case) a Notice of Opposition was filed in the name of Carol Almond-Martin. After receiving a copy of the Notice of Opposition, Novo Nordisk requested an extension of time of one month within which to pay the acceptance fee in order to revive the application. the Patent Committee was informed of this development, and immediately decided to seek reinstatement of the application. When a Patent Application is opposed, it assumes significantly greater commercial and strategic value since it is clear that a competitor is interested in the technology covered by the claims. Accordingly, the Patent Committee decided that a request should be made to extend the time for payment of the acceptance fee for the Patent Application. I am sure that if I was aware, or if the Patent Committee was aware, on or before 22 October 2010 that the Patent Application had been opposed, we would have instructed our Australian attorneys to pay the acceptance fee immediately in order to maintain the Patent Application in force. Novo Nordisk submitted this additional ‘evidence’ (although it could be argued that it is little more than opinion or hearsay – as opposed to actual minutes of the meeting) to support a secondary argument that the failure to pay the acceptance fee was due to a circumstance beyond their control, namely the delay in communication of the Notice of Opposition. Successfully arguing a case is generally as much about how the facts are presented (i.e. the way the ‘story’ is told) is it is about the facts themselves. Novo Nordisk had two stories to tell. The first story is about how Ms Nilsson made an error or omission in failing to ascertain the status of the patent application before providing her recommendation to the Patent Committee. As a direct result of this error or omission, the Committee lacked information that may have resulted in a different decision – after all, if the reason for abandoning the application was to ‘reduce prosecution costs’, then there would be no need to do so if all of the prosecution costs had already been incurred. The first time that the Committee became aware of the full circumstances was when they received notification that an opposition had been filed, and they then acted immediately to remedy the situation by requesting an extension of time to pay the acceptance fee. The second story is about how the Patent Committee made a conscious decision to abandon the application but, upon receiving notification of opposition concluded that the invention must be more important than they had thought, so they then decided to attempt to reverse the consequences of the earlier decision. The argument then goes that they would have succeeded if it were not for the delay in becoming aware of the opposition, which was a circumstance beyond the control of Novo Nordisk. There are a number of problems with the second story, not least of which is the fact that Novo Nordisk could never have had any expectation of receiving notification of opposition in time to use this as the basis for whether or not to pay the acceptance fee. It is perfectly legitimate to file a Notice of Opposition on the last day of the opposition period, and service of a copy of the Notice on the patent applicant is only required to be effected ‘as soon as practicable’ thereafter. Most importantly, however, the second story undermines the first. Making a conscious decision to abandon an application, and then making a further decision to revive it on the basis of new information regarding its potential significance, is inimical to the argument that the abandonment was the result of an error or omission in the first instance. The Hearing Officer also found that even if the service of the Notice of Opposition after the deadline was a circumstances beyond the control of Novo Nordisk, this was not causative of the failure to pay the acceptance fee (at ). It is, of course, common to run a case on as many grounds as might be available, with the intention of maximising the prospect of success on at least one of those grounds. In this case however – and with the full benefit of 20/20 hindsight – it is clear that Novo Nordisk would have been better served by restricting its application to the ground of ‘error or omission’. Mr Kellberg’s evidence relating to the alleged ‘circumstances beyond the control’ of Novo Nordisk clearly undermined the argument that there was a relevant error or omission in Ms Nilsson’s failure to inform the Patent Committee of the status of the application. Furthermore, the argument in relation to the alleged ‘circumstances beyond the control’ of Novo Nordisk appears to have been bound to fail. There is, of course, no guarantee that the extension would have been granted in the absence of Mr Kellberg’s evidence. However, it is clear that this evidence harmed the case for an extension on the basis of a causative error or omission. The Australian provisions regarding extensions of time are relatively generous, and almost any missed deadline can be recovered – usually at relatively modest cost – in any reasonable circumstances in which a genuine error or omission has occurred, or where the circumstances leading to the error were beyond the control of the relevant parties. Quite aside from the obvious benefits of these provisions for IP owners, they mean less stress than might otherwise be the case for Australian patent attorneys! Even a sole practitioner could easily have hundreds of live matters at any given time, and despite having the best possible practices, support systems and procedures in place, ‘stuff’ happens – alarms are missed, systems crash, hard drives fail, correspondence goes missing, laws change (or are ‘misunderstood’), people fall ill, and we all of us have bad days and (increasingly) ‘senior moments’! However, it is important to tell a story about the failure that clearly addresses the relevant criteria for obtaining an extension. The process begins by identifying a clear prior cause of the missed deadline, and determining whether this falls into the category of ‘error or omission’ or ‘circumstances beyond control’. Sometimes more than one event will conspire in a single chain of cause-and-effect – for example, a postal delay (circumstances beyond control) may be combined with a failure to forward the correspondence to the appropriate person in a timely manner when it finally is received (error or omission by mail room staff). Once the cause of the failure, and the resulting sequence of events, have been identified, the evidence in support of the extension request can be prepared. As far as possible this should be constrained to the facts of the case, and avoid unnecessary forays into opinions or speculation as to what might have been – there is plenty of scope for this (if appropriate) in the submissions that will accompany the request and evidence. Nobody can truly say what they would have done if circumstances had been different. What they can say, however, is what they normally do in comparable circumstances. how/why/when these processes broke down in this case. If the story establishes a causal chain of events leading from a relevant event to the missed deadline, and the evidence supports the story, then the prospects of an extension being granted are very good. 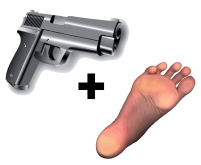 And a final warning – always take care not to shoot yourself in the foot!